He proves that you can be funny AND thin! He’s definitely paving a new road for where he looked like he was heading. His funny guy roles are now being balanced out by stunning serious performances. ‘Moneyball’ saw him go straight-faced and thinner. Which everyone took notice of with Oscar, Golden Globe and BAFTA nominations for Hill’s role in the baseball-thinker. 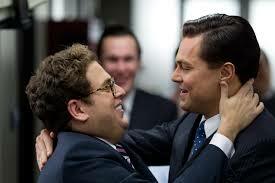 Now with ‘The Wolf of Wall Street’, DiCaprio, Hill, the film’s director Martin Scorsese, the screenplay and the film, itself are all up for Oscar nominations because the film was such a huge success. What better place to look for talent for a new project, but to the celebrated pair of DiCaprio and Hill? So we get to see Hill and DiCaprio in Fox’s newly acquired project based off a 1997 Vanity Fair article “The Ballad of Richard Jewell“. Hill is set to star as the titular Jewell. Think back to the 1996 Olympics in Atlanta. We remember the bombing. We probably also remember the security guard, hailed as a hero,who discovered a suspicious backpack, then aided bystanders in clearing the area. The media discovered Jewell had been questioned by the FBI and they cleared him within 3 months time of having anything to do with the bombing. However Jewell was vilified only 3 days after being hailed a hero. Much of the cause for this is America’s need to have someone to blame, and nonstop, 24 hour news coverage. His name was constantly mentioned in connection with the incident. They took the story of a man, a former sheriff’s deputy, who earlier that year moved in with his mother to care for her during a health crisis, and took a security job because he thought it would be strong resume material as he tried to become a cop, was suddenly depicted as a 34-year-old loser who lived with his mother. Hill’s portrayal of Jewell is going to be supported by DiCaprio, playing a lawyer the accused knew casually. The Southern attorney who mostly did real estate closings jumped in over his head, but guided Jewell the best he could through a hellish ordeal that went on and on regardless of his officially cleared name. The project based on the media circus that was Richard Jewell’s life, comes right around the corner from the Sochi Winter Olympics. The film is to be produced by DiCaprio and Jennifer Davisson Killoran, Hill and Kevin Misher and Andy Berman. If there’s anything we can learn from Jewell’s life is for the media not to jump on someone as Jewell put it, “like piranha on a bleeding cow”. We can try to remember that it’s not up to us to trample someone’s rights just because they were in the wrong place at the wrong time. After the ‘Atlanta Journal Constitution’ wrote a front page story that flat out said Jewell fit the profile of a lone bomber, thousands of reporters camped outside his home, after the FBI tore said home apart looking for evidence and taking physical samples. It would be hard on anyone to be scrutinized that closely, so it stands to reason that his mother was traumatized by the events as they unfolded. From a raid of their home, to stations reporting the FBI probably had enough to arrest and charge her son, but not enough to convict, yet. Jewell was the new hot button topic for evening variety show monologues. Jay Leno, in particular, made him a nightly running joke on ‘The Tonight Show, poking fun at his weight among anything else they could bust his balls on. 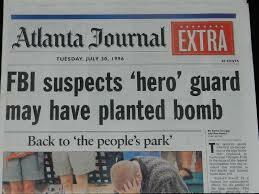 Journalism took an ugly turn when Jewell’s involvement in the bombing went from hero to false reporting. CNN ran an untrue story that he was seen before the explosion with a homemade bomb. Lawsuits were filed against quite a few news agencies and settled which seems to be very little victory as far as his name went. Jewell died in 2007 at 44 years old from some pretty serious medical problems. After having a few toes amputated, he went downhill from there. The obituaries called him a hero. An anti-government militant later confessed to the crime. This entry was posted on Tuesday, February 4th, 2014 at 8:16 pm	and is filed under Film, News. You can follow any responses to this entry through the RSS 2.0 feed. You can skip to the end and leave a response. Pinging is currently not allowed. « Ryan Phillippe Set to Star in ‘Secrets and Lies’ for ABC! !